I found this bib necklace (and a white one) at a cute little shop in the Heights. I like finding unique accessory pieces and adding them to my everyday wardrobe. I don't have a big closet so I change things up with accessories. 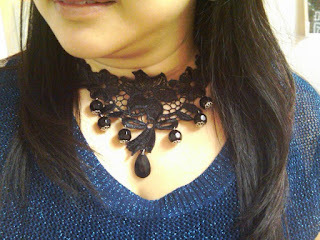 I know I've seen lace work like this around - I think next time I might have to try making one of my own!